Handle Chihuahua puppies using both hands. Chihuahuas are tiny, fun dogs. These pooches may have long or short hair, and can be bred in many different colors. The breed originated in the Mexican state of Chihuahua, and this small dog has become a much-loved pet in many countries of the world. Chihuahua dogs are not very well designed in terms of giving birth. The puppies often are born by cesarean section, because the mother dog has a small pelvis and each puppy has a large head. The newborn puppies do not open their ears or eyes for a few days after being born. During the first few days, chihuahua puppies mostly drink their mother's milk and sleep. Some breeders will have a litter of chihuahua puppies suitable as pet or show dogs. Pet chihuahua puppies may be adopted as soon as 3 months after birth, but breeders may wish to keep a potential show dog with the mother until it is 6 months old. A breeder who will let a puppy leave the home when the pup is under 3 months old is acting irresponsibly. Whether you want a pet pooch or a prizewinning show dog, you should choose a puppy that is healthy, strong and inquisitive. The puppy's fur should be free of bald patches, and its teeth and gait should be healthy. Chihuahua puppies tend to be born in small litters, so the pups often will play with each of their siblings at length. Often, one puppy in the litter will be dominant over the others, displaying bossy or even bullying behavior. On the other end of the spectrum, there often is one smaller, weaker or shyer Chihuahua in the litter -- this pup may get bossed around or shoved aside by its siblings. Author Jacqueline O'Neil indicates that the best pet or show Chihuahua usually is the dog that stands up to the bully in the litter, then goes peacefully on its way. 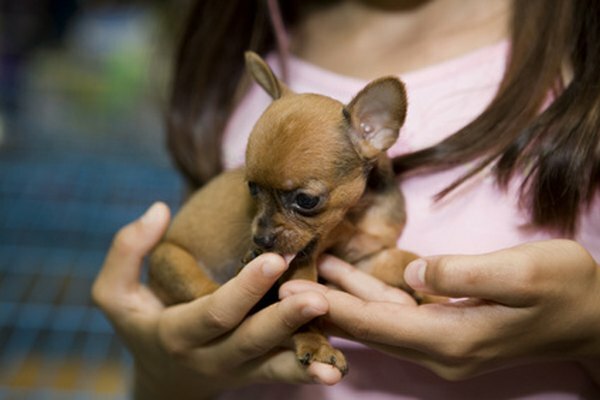 Chihuahua puppies are tiny, but you still need to lift and handle the dogs with care and full support. Never lift a puppy by its front legs, as this can injure the Chihuahua. When handling a puppy use both hands to support the dog's torso and rear -- don't leave the pup's back legs dangling in mid-air. Feed your pooch an appropriate quantity of puppy food until around 18 months old, when your Chihuahua is considered an adult dog. What Are the Treatments for Subluxation of the Patella in a Chihuahua?